Most people who get a new puppy are excited to bring them home, let them romp around their new yard, get a treat and find a cozy place to nap. They usually have a life marked by hours of play and leisure. Other puppies are selected and trained for special missions such as helping those with handicaps, working with the military or law enforcement, or in one special case here locally, working at the Probate & Family Court at the Midland County Courthouse. “Courthouse Clyde”, as he is fondly known is a yellow Labrador Retriever born in Midland at Gaffke Farm. He came to the Midland County Courthouse at just eight weeks old in May 2017 and has been a welcomed addition as a therapy dog at the Probate & Family Court. 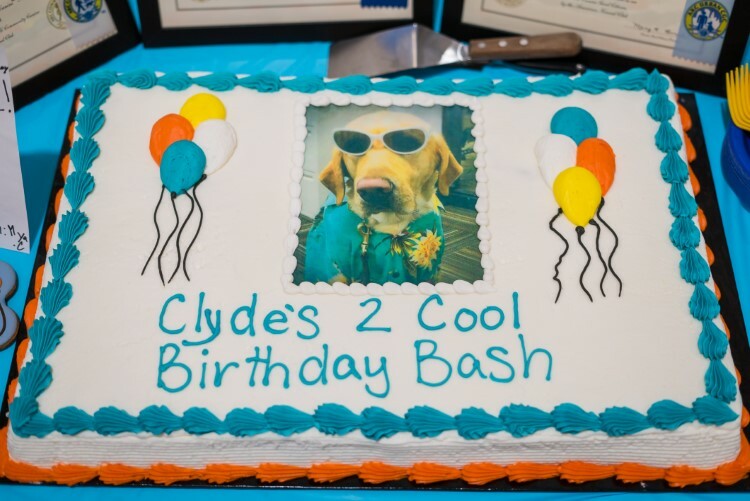 Clyde is so popular he has his own Facebook page and is often recognized around town. As a therapy dog, his role is to provide comfort and support to those who come to the courtroom in what can often be difficult or stressful situations. He helps soothe the stress and tension, and even bring some comic relief, to those who appear before the judge. When emotions run high before a hearing, Clyde takes action and helps distract those from the formal proceedings and has been known to do some tricks with giving ‘high fives’ and handshakes. Children love him, and adults find delight in Clyde’s friendly behavior. Judge Dorene Allen had a desire for many years to have a therapy dog dedicated to the courthouse, so when Clyde was born, she selected him for this special mission. “I’m thrilled that Clyde feels right at home here. He has been a tremendous asset to the courthouse with his ability to ease the tension and provide support in so many special cases,” said Judge Allen. Clyde is owned by Judge Allen and her husband, Bill Collins. Clyde celebrated his second birthday on April 3. While in training as a puppy, Clyde spent several months getting familiar with the front office of the Probate & Family Court. He was trained by Deputy Probate Register, Katy Mishler and Jen Marenich, owner of Ironpaws Dog Training in Auburn, as well as others on the staff who have been a part of his development. 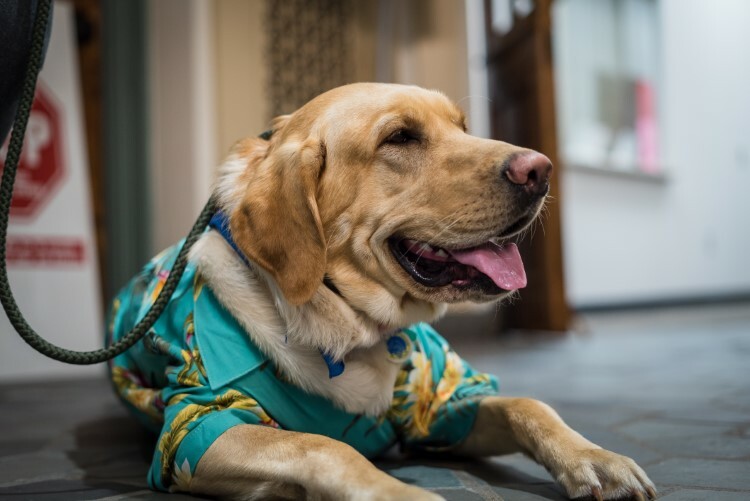 As a puppy, Clyde would make appearances in the courtroom from time to time, but as he has matured, he can now be found in the courtroom on a daily basis mingling with families and bringing smiles to everyone he meets. He has proved to be a quick study as well. Clyde is certified in Canine Good Citizenship and has also taken and passed the Urban and Community tests as part of this certification. The Probate & Family Court sees cases regarding child abuse and neglect, developmental disability guardianships, adoptions and a range of juvenile matters including delinquency issues. These can be very stressful and sensitive events. Clyde with Judge Allen and Deputy Probate Register, Katy Mishler. In delinquency cases, if a juvenile comes in for a review hearing, one of the incentives is to see Clyde and have the opportunity to include him in their hearing. It’s at the discretion of the Probation Officer as to whether or not Clyde’s presence in the courtroom is appropriate. A large factor in that decision-making is whether the juvenile has been violation-free since their last review hearing. Not only has Clyde been making a positive impact on those who come through the court, he has also made special appearances throughout the community. He has visited the local schools with Judge Allen as well as the Department of Health and Human Services and Pinecrest Farms. Clyde is an honorary co-chairman of the Midland County Flower Fund with his handler Katy Mishler and Financial Officer, Kristi Meyers. He is also an honorary Rotarian in Midland County. How many other canines have these community credentials? He also participates in the annual Adoption Day as “Super Dog” in November at the Courthouse which is an exciting day for families. A dog's day at the office includes tail wags and high fives. Clyde has become so popular in and around Midland that he has his own Facebook page with a loyal following! Not many dogs are as social media savvy as Clyde, but he lives for the moment and brings joy to those he meets. You can keep up with his fun posts, pictures and videos by following “Courthouse Clyde” on Facebook. 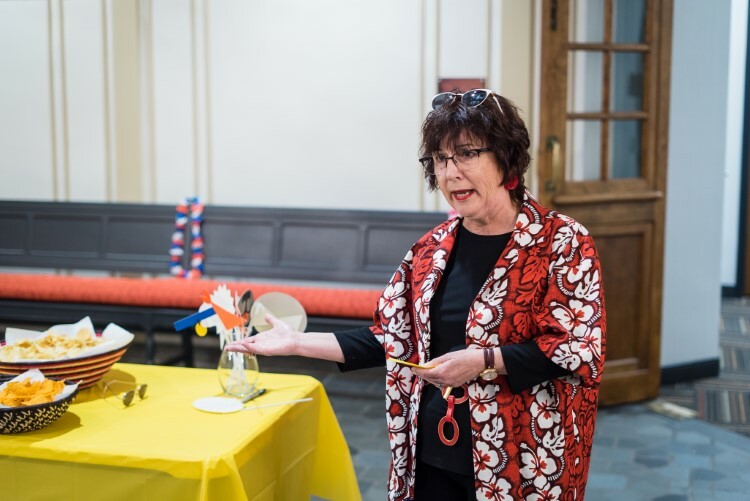 Clyde just celebrated his second birthday on April 3 and a party was held in his honor in the historical lobby of the Midland County Courthouse and many came to celebrate. 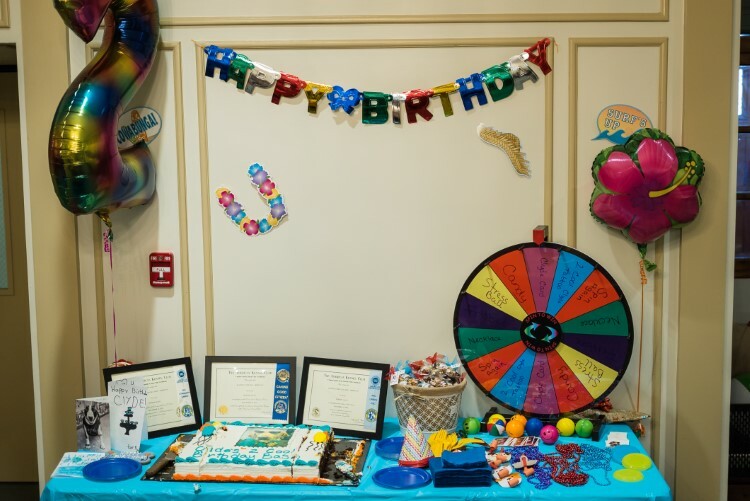 His “Two Cool Clyde” birthday with a Hawaiian theme was fun for the courthouse staff and friends who stopped by to enjoy the birthday festivities, enjoy the cake and dog treats and celebrate his great work in the community. Judge Allen spoke about Clyde’s purpose and how he has helped so many people. Allen gave a few examples of how his instincts pick up on those who are traumatized or highly stressed and how he will go to them, put his head on their lap and help calm them down. Judge Allen talking about the important work that Clyde does at his second birthday party. To the team that cheers Clyde on in his work, Allen expressed her appreciation to the courthouse staff. Officer, you gonna eat all of that cake? 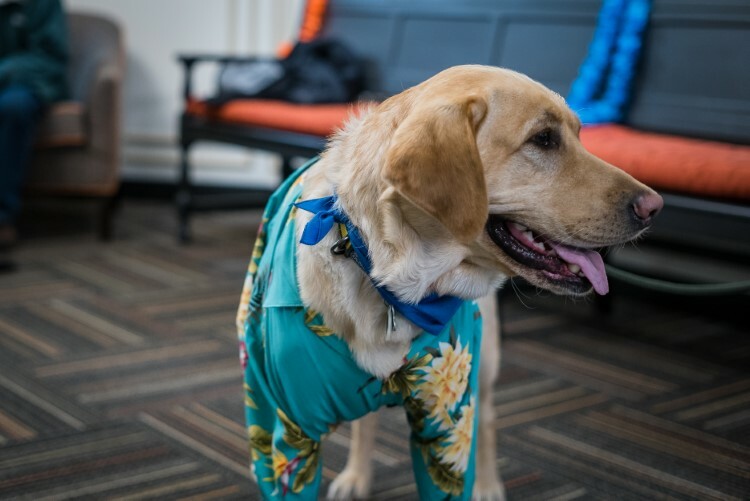 When Clyde is not working in the courtroom, he can be found playing fetch with his favorite toy, taking long naps and learning new tricks at the front office. At home, he likes to unwind and act like any fun-loving energetic puppy, playing with sticks and chasing balls. He loves going on runs and playing with his best friend, Bowie, Mishler’s family dog who is a local rescue. From time to time he also meets up with one of his litter siblings, Grace, a black Labrador, and enjoys running in the fields with her. Grace, who is two years old as well, is owned by Elizabeth and Keith Lumbert. Happy Birthday Clyde and thanks for all the wonderful work you do! With his fun-loving manner and tail wagging welcome, Clyde will continue to be an integral part of the Probate & Family Court here in Midland. Stay tuned for a future story on two other dogs who work within the Midland court system - Dory, who works at the Midland County Juvenile Care Center, and who stopped by Clyde’s birthday party, and Joey, who works in the Prosecutor’s office. 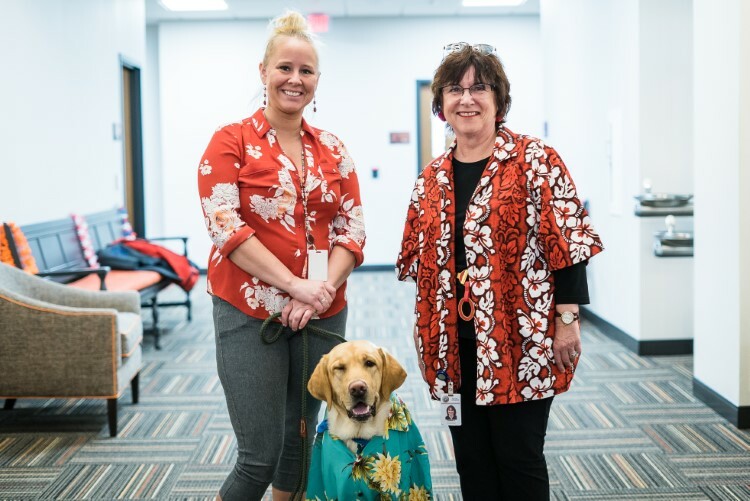 Both of these canines, like Clyde, support the staff with their cheerful behavior and their calm and nurturing approach to their community work.